Every once in a while we get a relatively easy solar pool heater installation on our schedule. It’s a welcome break from steep roofs, long plumbing runs, and roof types that require extra care in terms of safety, protection of the roof, and installation difficulty. Starting and finishing a job in one day is definitely a satisfying experience. That’s not to say that we don’t put the same degree of workmanship and excellence into the easy ones. In fact, shingle roofs come with some important tasks. We use an exclusive aluminum flashing and roof protection system (which you can’t see in the picture because they are under the shingles and panels). We also use a special base plate under the plumbing clamps that elevate the plumbing off the roof surface. 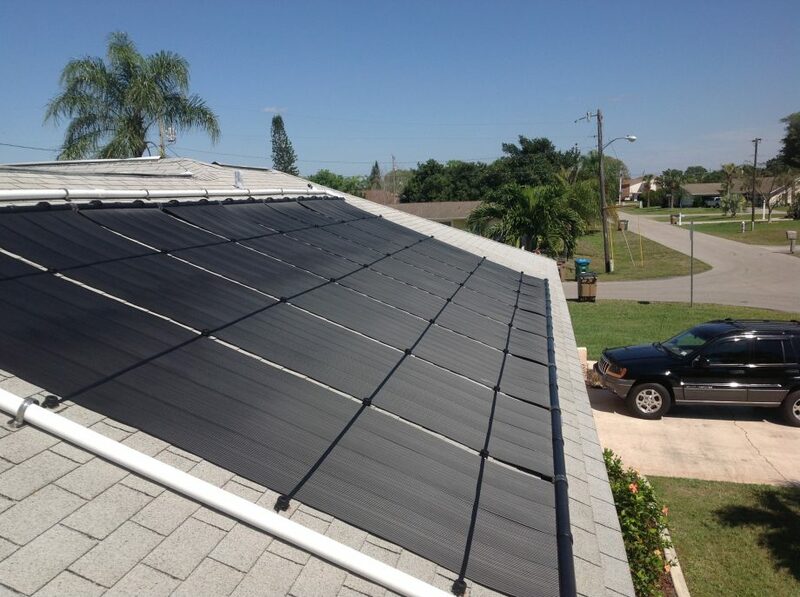 This is another Florida Solar Design Group exclusive in Southwest Florida. It’s these little details that make even the easy and quick installations the best available. This solar pool heater, installed in March 2016, took one day to complete and represents one of the easier installation scenarios we encounter. Our exclusive plumbing clamp base elevates plumbing off the roof. Plumbing and fittings wearing and tearing shingles is one of the most devastating problems that plague the industry. Our care, attention to detail, and superior product makes this concern a thing of the past. 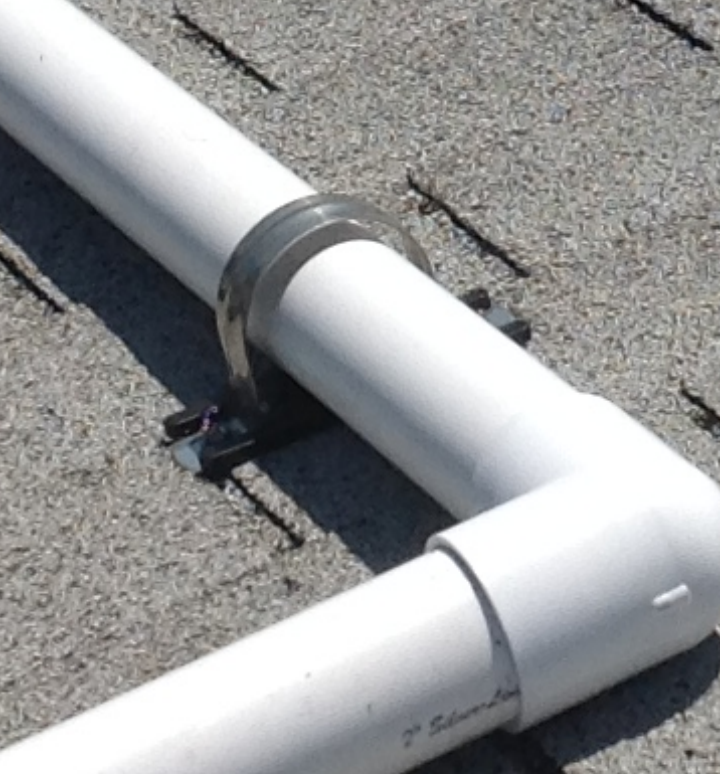 Our PVC pipe clamp with base pad is a purpose-built assembly that keeps pipes off the roof surface. 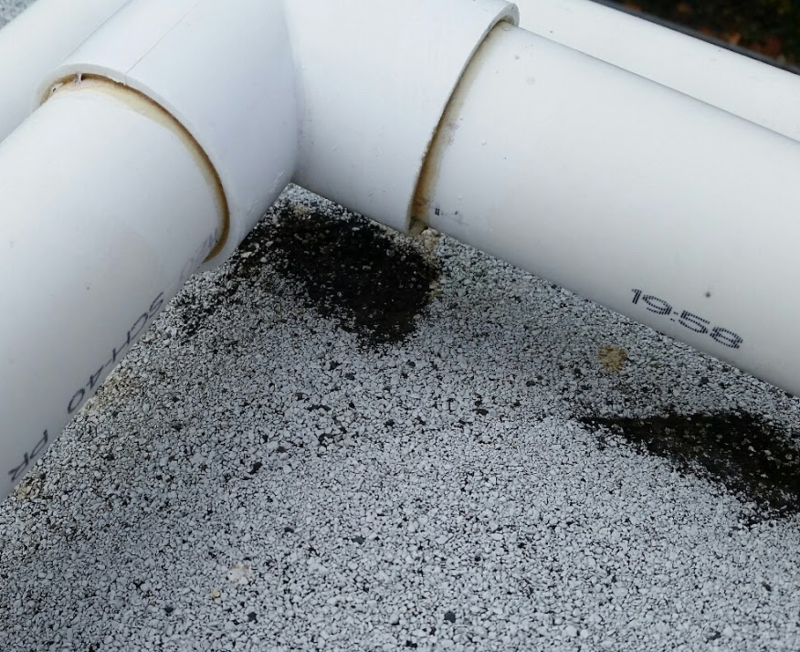 A competitor’s PVC pipe has rubbed down to the asphalt on a shingle roof. A system like this can be installed in just one day. We need from 1-5 days to get a permit, but as long as we have the trained worker to install it, you can enjoy solar pool heating in under a week in many cases! Nice. Absolutely love the plumbing attached so neat and awesome. Can you install a pool heater before summer for me? During the busy spring season we can usually accommodate a solar pool heater installation in 1-3 weeks. Looks like one that is much easier, like you said. The service you provide is a good one and it keeps people off the roof. Definitely a job that you need major safety techniques intact. Love the look of this pipe clamp. It just makes the whole thing look nicer and probably keeps the pipes in better condition too. Does this help with wear and tear on the pipes? It’s not so much about wear on the pipes, which is not an issue. The concern is wear and tear on the roof, which these clamps prevent.